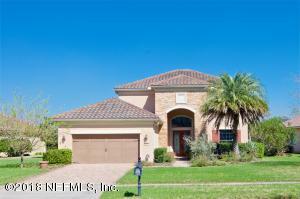 Luxury Living in Ponte Vedra's finest 55 + community. This stunnning waterfront CONCRETE BLOCK BUILT! Barrel Tile roof, home has Storm room, Storm Shutters, large screened lanai with Outdoor Kitchen. 3 bd + den, 2.5 baths. Master bd on first floor, Custom walk in closets, 2 bdrms + loft upstairs, perfect for guest privacy. A GOURMET kitchen w/built in SS appliances. Wine Cooler, cherry tone cabinetry, breakfast nook, GRANITE countertops and Large Island. Custom upgrades throughout: electric shades, NO CDD FEE!, Surround Sound system: secruity system and so much more. Owners enjoy the Anastasia Club w/indoor & outdoor pools, pickle ball/tennis/bocce, fitness center. Minutes away from Nocatee Splash Park & the Ocean! ($599.95 General Main fee) A beautiful home! MOTIVATED SELLER!!!! This home has been on the market since Mar 02,2018. Courtesy of BERKSHIRE HATHAWAY HOMESERVICES FLORIDA NETWORK REALTY.